In the wee hours of Saturday, May 29, 2010, Michael Vernon Dobson, Sr. traded his earthly battle with cancer for an eternal peace with God. I have chosen to remember and honor my good friend and brother with the following words that are born from discussions in which we would become engaged. Hard to believe it’s been a year already. I was almost a teenager before I came to realize who Mike was and with fourteen years between his birth and mine it would be hard to expect much more. Over the years, whenever our paths would cross he would share encouraging words but at that time our relationship was fleeting, at best. We realized the fourteen year gap had closed quickly in 1998. 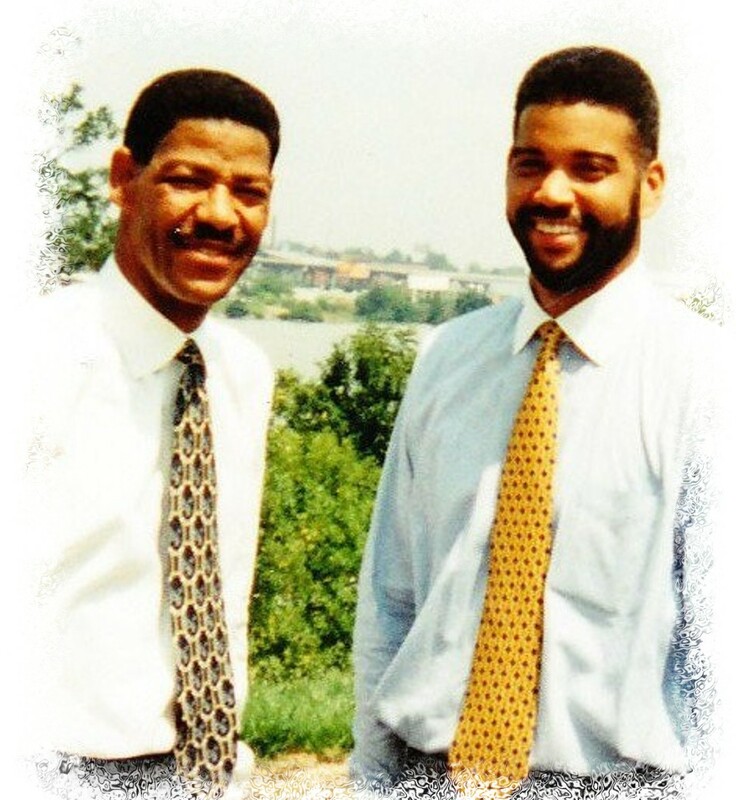 It was in that year (March 16, 1998 to be exact) that Michael was sworn in as a member of the Maryland House of Delegates from the 43rd district in northeast Baltimore City, Maryland. He was to finish out the last month of the term for a legislator who resigned in the midst of an ethics investigation and then head immediately into a campaign to be formally elected by the citizens of that district. At the time I was contemplating a run for the Maryland House of Delegates hoping to represent Maryland’s 41st legislative district in northwest Baltimore City. The very same district my father first represented twenty years earlier for eight years. Mike and I were both victorious. We did not see eye-to-eye on every issue but we respected each other’s opinions and spoke candidly with one another about the aches of our community, the chasm that exists between leaders of years gone by and these self/media appointed leaders of today. And no discussion would be complete without a thorough examination of our own foibles and failings while navigating the slippery terrain that is politics. Somehow, we unceremoniously formed a bond around our genuine concern for the welfare of “all God’s people” with an extra helping of love for “the least of these”. We would retell stories of national events around civil rights and how those events helped frame Baltimore’s battles for civil rights and vice versa. We discussed leadership in general terms and Black leadership specifically. We discussed examples of those who were about lifting the people and our disgust for those who managed only to lift themselves. These stories … these concerns were our fathers’ before they were our own. My father, the late Rev. Wendell H. Phillips, was a graduate of Virginia Union University (VUU). He got to Union as a result of an “academic vacation” during his freshman year at Penn State but not before befriending the likes of Lenny Moore and Rosie Grier – both NFL Football Hall of Fame greats. In fact, my father and Rosie were line brothers and initiated into the Gamma Nu Chapter of Alpha Phi Alpha Fraternity, Incorporated in 1952. My father found himself at VUU reluctantly following in the footsteps of his father, the late Rev. Dr. Porter W., Sr., three brothers, the late Rev. Porter W, Jr., the late Rev. Channing E. and Treadwell O. who lives in Columbia, Maryland and one sister, Marie, who lives in Flossmoor, Illinois. The last Phillips to attend VUU, Rev. Dr. F. Allison Phillips, is the youngest of the clan and resides in Shaker Heights, Ohio. Dad’s major was pre-med before he met the likes of VUU’s then President, the Rev. Dr. Samuel DeWitt Proctor, yet another one of God’s earthly giants. I spent most of my childhood and virtually all of my adolescence in the church and I don’t just mean in church services but in the physical building! I sat quietly at the feet of some of the greatest and most unsung political minds Baltimore City will ever know – scratch that – some of the greatest minds, period! Who were they, you ask? Well, of course, my father, the late Rev. Wendell H. Phillips, the late Rev. Frank L. Williams, Revs. Vernon & the late Harold Dobson, Rev. 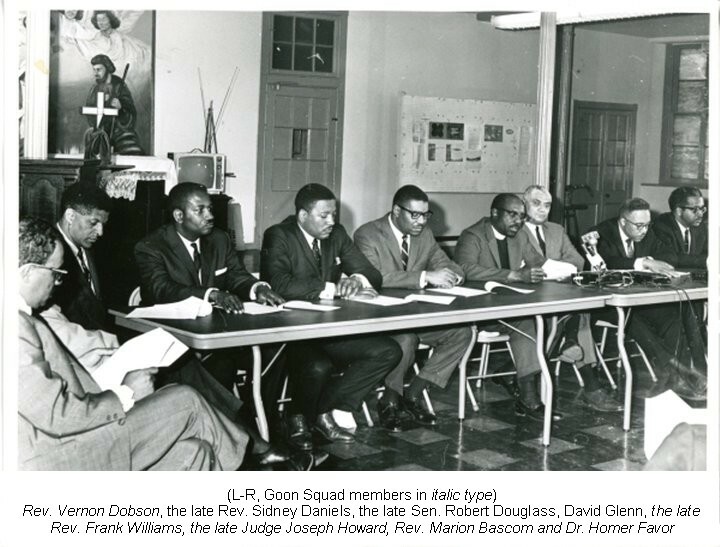 Marion C. Bascom, the late Congressman Parren J. Mitchell, the late Prof. Augustus “Gus” Adair, the late Judge Joseph C. Howard, Prof. O. Patrick Scott, Attorney Lalit Gadhia and Dr. Homer Favor. Frank Williams, a few years their senior, was the Professor X to their X-Men, if you will. These were my Saturday cartoon Superheroes. They weren’t mutants with extraordinary powers but ordinary men called to do extraordinary things with the help of their God. These eleven men comprised what became known as Baltimore City’s “Goon Squad”. 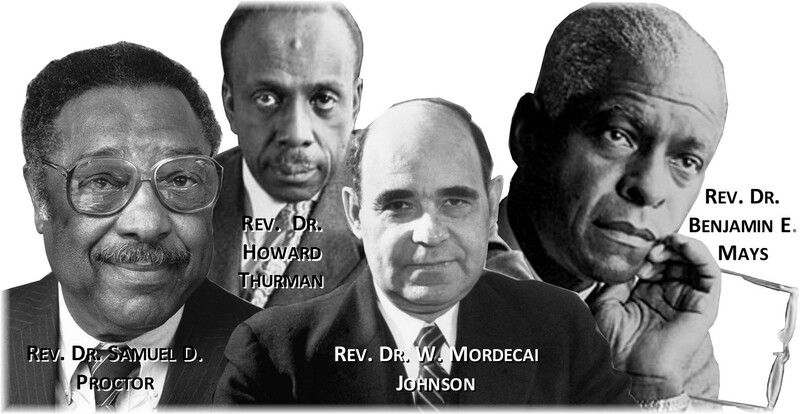 They were activist theologians and not just preachers but pastors and counselors. They were university professors, grassroots community leaders who became members of Congress and state legislators. They were great legal minds who became federal judges. They were activist political scientists and activist economists. They looked for justice with a telescope and examined injustice with a microscope. They believed in an all-powerful God; a God who was God of all or He wasn’t God at all. They each had an activist mentality and a theopolitical bent toward life and matters of justice. These men – who happened to be men of color – were my tangible, living, breathing scripture. They believed and lived the words in the New Testament’s book of Matthew 25:40, “…whatever you did for one of the least of these brothers and sisters of mine, you did for me”. They prayed as if it all depended on God then got up and worked as if it all depended on them. One of the most unique characteristics of this group of men was that while each of them were leaders in their own right, once this group of leaders was operationalized there was no one leader and if you forced them to pick it was based simply on chronology with the assumption that wisdom and respect come with age. They moved not unlike that flock of birds we have all seen on large fields, when all of the sudden the whole flock – every single bird – begins flying in the same direction at once. There is no “lead” bird like the ones that fly south for the winter forming the large “>” overhead. No, these birds are much closer to the ground. It’s almost as if they feel something is not right with the spot they are in … and so, all at once, they lift off together, if need be, change direction in flight together and land in a different spot … together. It was as if there was some clarion call from a frequency “on high” to which only that particular flock at that precise moment could attune. And so it was with these men. In an interview with Rev. 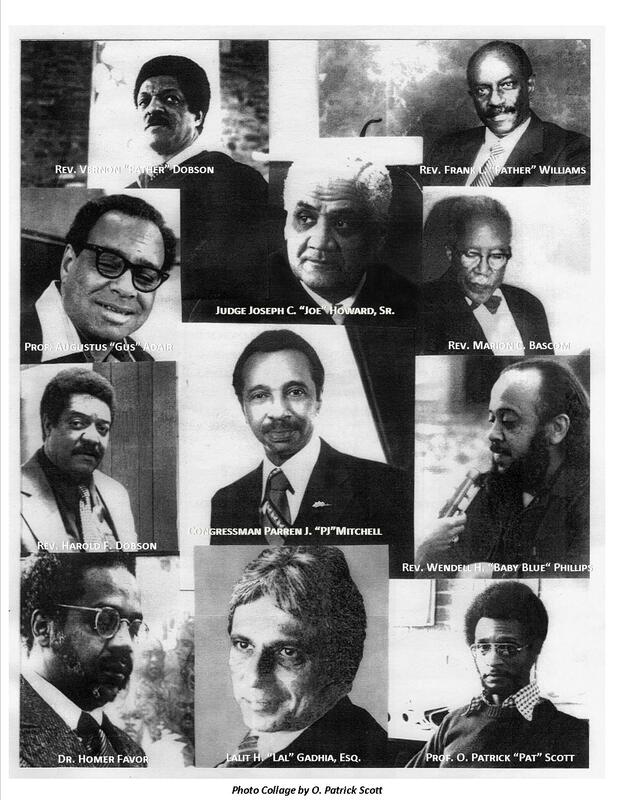 Marion Bascom, Dr. Homer Favor, O. Patrick Scott and Lalit Gadhia, Bascom said, “I don’t think that any of us – in those days – were concerned about who was gonna lead … I don’t think there were any ‘drum majors’ … I don’t think there were any ‘pretty preachers’”. It was clear that there was work to be done and they were about the business of doing it without regard for who was credited with task completion. The Goon Squad had no articles of incorporation or by-laws. There was no paperwork to either bind or bound them together. They weren’t even concerned with a name. In fact, by some accounts, the name was given to them by a reporter who referred to them – these men of God – as a “goon squad”. It was not espoused as a term of endearment but rather a derisive term foisted upon them with hopes of discouragement. They found the reporter’s contemptuous and opinionated reference amusing. Soon they began to refer to themselves as the “Goon Squad” with tongue in cheek. Each reference was garnished with a chuckle that reminded them of the arrogance of White entitlement they faced in all the battles they fought. The battles were epic and they may have seemed at times to be against individuals but I assure you they were fighting institutions. The more battles they fought the more the name stuck. It is impossible to think that this assembly of men from different parts of the nation (and world with Gadhia hailing from India) just “happened”. This was a disparate group of men who were “drawn together by forces that we knew nothing about …” said Favor. He went on to explain that each member was an “egomaniac” in his own right and no organizational model could define them. It was most certainly Divine intervention “for a time such as this”. The “Goons” were problem solvers. There is a “tendency to romanticize what we did”, says Bascom, “but it wasn’t rocket science”. They assessed the hurts and pains of the community, they evaluated how or if elements within the realm of their chosen profession – read “calling” – helped exacerbate those hurts and if so, they set out to right wrongs then and there. In some cases their calling afforded them the opportunity to reach large populations at once and mobilize them. Whether it was the pastors in their churches, professors in their classrooms or community organizers in the streets, amassing large numbers of people for any given task was never a problem. The “Goons” had the ability to assess pain, decide the best course of action and execute a remedy. It was community triage. There were always enough people and depending on the issue you may find any number of people who have considered themselves a member of the “Goons” and for that issue, that period, that moment … perhaps they were. But these eleven men (ten once Frank Williams was moved to D.C.- more on that some other time) were the constant in every battle. The Goon Squad knew the power of numbers and operated on the old proverb, “sticks in a bundle cannot be broken”. They spoke in first-person plural. It was never “I” always “we” … always “us” never “me”. But that was then. Some forty-five years ago. If you never had the pleasure of meeting these eleven dynamic men, I am sorry to say you never will get to meet them all … at least not here on earth. Unfortunately, Frank, Wendell, Joe, Gus, Harold and PJ have completed their work here and passed on. But fortunately, God loved us enough to let them pass this way if only for just a little while and I am glad they were there to welcome Mike with open arms. The others? They are still around. My “Uncle(s)” Vernon is 88, Marion is 86, Homer is 87, Lalit is 72 and Pat is 71 years of age. They are never more than a phone call away. Still willing to help, teach and support me to this day. If you ever find yourself in Baltimore you may see some of them ambling about; minds ever sharp though recall may take a moment, but hell, if you catch me on the right day it may take a moment for me, too! interviewed me on the mission. The next day I awoke to a headline screaming Moore calls “police the enemy of the black community”. Immediately I was denounced as an outside agitator on the floor of the Maryland General Assembly by a prominent African American state senator and called a Maoist by others. I had been a proud member of the Jackie Robinson youth Council of the NAACP. Members of the “Goon Squad” came to my defense. They then organized a truce between me and State Sen. Clarence Mitchell III. This would be symbolized by having the two of us Shake hands at the first meeting of the Black United Front. later that spring, following the riots in the wake of Martin Luther King’s assassination, Gov. Agnew would use that symbol to accuse black leaders of being intimidated by me and other black militants (his terms) as the reason for the riots. Some of us believed Agnew was attempting to blame us for the riot, but members of the “Goon Squad” sensed what Agnew was attempting to do and led a walk-out of an impromptu meeting the Governor called for that purpose. We of course do not know all of Agnew’s reasons but some of us believed that Nixon picked him to be his running mate on the strength of his performance in talking down to black leaders. We however do know that he would disgrace himself for not being a honest fellow. We do know that the “Goon Squad”, were Christians of the highest order and keepers of their brothers and sisters faith in justice. Thanks for dropping by. The piece didn’t start out to be about the Goons but their spirit kind of guided me there. It is clearly a start and between the two of us perhaps the rest of the world will catch on that all power really does belong to ALL the people. Uncle Homer & Uncle Marion still reference that fabled meeting with Governor Agnew to this day without missing a beat! Thank you (not so) young (anymore:) brother, for your spiritual leadership and the history lessons that bind us. I had adopted the practice of not responding to my own posts from FB with hopes of not steering conversation but stimulating thought. However, it came to my attention that with blog posts it could come off as rude. So let me first apologize for not responding. Thanks for taking the time to visit, read and actually respond to my thoughts. Your encouragement is indeed appreciated. I appreciate our late in bonding but strong friendship. From one WP PK to another, lol! i Attended a tribute to Pastor Dobson on yesterday at St. Mark Institutional Baptist Church (founded by Dobson’s Father) . What an awesome history lesson on the History of Black Power and Civil Rights in Baltimore and the Nation!Your written reflection and photos helped put a lot in perspective. Great experience….. Thanks so much. I’m sorry that I couldn’t attend but my mother was there. I’m glad the story is getting out because so many think they have gotten where they are by there own efforts yet we ALL stand on slmeone else’s shoulders. The Goon Squad was well aware of that fact. They truly practice/d what they preach/ed. Outstanding men both individually and collectively. Wendell, thank you for sharing this beautiful piece which so accurately captures the spirit and influence of your dad, Judge Howard and the rest of the “Goon Squad” change agents. Wendell H. is surely smiling. Hey Wendell. I just had to go back and read this again. It was powerfully written and a good story on what our Fathers dedicated their lives to. Great piece. Rev Harold Dobson, May he Rest In Peace. I echo what Mr. Peters told you in 2011…WRITE THE BOOK!!!!!!!!!!!!!!! Thanks for this wonderful piece of history Wendell. You came in right on time tonight. To God Be The Glory. Wendell, I just returned from a family reunion on my Mother’s side. It was a first for me and we had a great time. I did all the research through ancestry.com and present our lineage through a tree and a presentation. I’ve done similar for my Father’s side of the family. He’s coming down in a few weeks to see my son’s last baseball tournament for the Summer. We’ve been discussing how he wanted to chronical the contributions on the Goon Squad and his life. I always like to go back and read, “Wendellswrite” because it is so similar to my own experiences. They were GIANTS and courageous men. I can remember conversations that ranged from civil and human rights to religion and spirituality. I got the concept of “thinking-out-of-the-box” from them. As I come to the end of my baseball ministry I try to reflect and pick my next path of service. I’m sure it will involve youth in OUR community and will be motivated by the influence I got from growing up at the feet of the Goon Squad. Keep up the awesome work and stay blessed, my Brother! Good morning Wendell, I too had the pleasure of basking in the warmth and wisdom of these great men and minds. Dr, Marion Curtis Bascom became my pastor when Reverend Wilbur Waters of Emmanuel C.C. past. I remember my first glimpses of him were in Mr. Jim Dorsey’s Citi-Service Station at Pennsylvania Ave. and Mosher St. Having had lunch with Reverend Bascom on several occasions in his church office and home on Park Ave. I soon came to know Reverend Frank Williams, Sr. who pastored Metropolitan United Methodist and befriended Frank, Jr. as many times we sat together during sermons at both churches. Later as a young father I met and conversed with David Glenn and broke bread with him at Sess Restaurant. Finally, as a fisher Reverend Bascom, Dr. Homer Favor and others including me would rent a van headed for Deale Island to go out on a charter to enjoy the beauty of the day and fish. Each of them have had a profound impact on my life, personality and I have etched some aspect of the entire group into my psyche. To this day, I write social commentary, work with younger men to mentor youth and facilitate young minds. My meager Sandtown/Winchester beginnings have provided navigation through many stormy waters but always to safe harbors. I appreciated reading your thoughts on these men who used their minds to promote civility, human rights, and dignity! It was my privilege to know some aspect of each of them. Matthew thanks so much for sharing your memories. Funny that you mention Frank Jr… Pat Scott was trying to reach him a couple of months ago but I don’t know how successful he was. I would love to break bread with you and share even more. Until that time, take care.